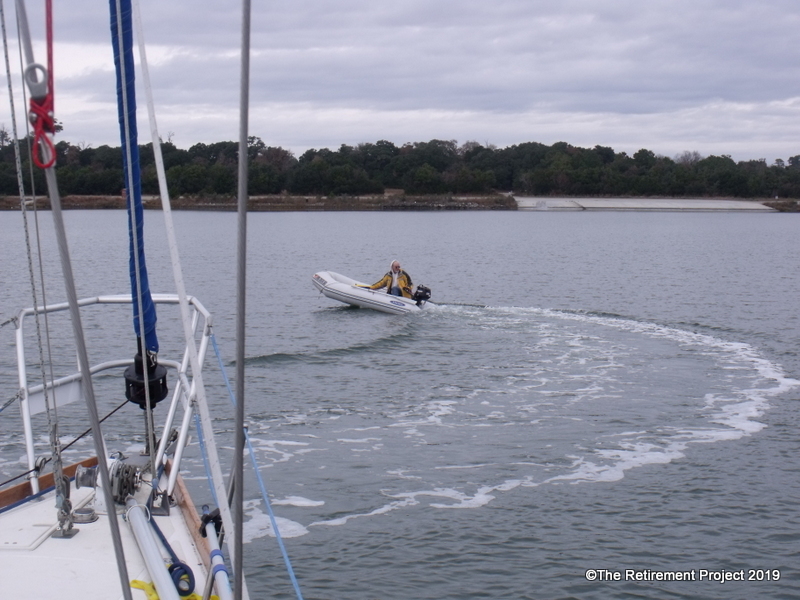 (or how to move onto a sailboat) With the advent of our 50th birthdays came the usual sorts of life evaluations that one goes through. At what have I succeeded? What contributions have I made? What do I have left that I want to do before I die? Living on the water was high on both our lists. For any who share the dream, and for our family members who might not understand, this is our story. We don't know where it will take us, but welcome along for the ride! For most people living and traveling on a boat requires some way to get back and forth to land without having to wrestle said boat onto and off of a dock. We had the Dink. It was bought used, dull gray, and powered by a tiny little outboard barely capable of pushing the thing across the water. I was never a big fan of the Dink, particularly when using it at night. But as the years rolled by I became a bit more comfortable in the thing. Moving back to land meant finding a wheeled version of the Dink; some way to get back and forth to various places miles and miles apart. Since the primary reason for our sojourn back to the hard was to shore up a badly depleted cruising kitty, spending a ton of cash on a new Land Dink seemed counter productive. Instead we found a used one at a dealer of good repute. It had low milage for its years and was a “fully inspected pre-owned vehicle”. There was enough money left in the bank account for us to pay cash. The radio, heat and air con worked. It kept me dry even when it rained. It had a cruise control, which was nice. And it had a remote starter, which became my new favorite toy. Aim the fob at it from the second story window of the shop’s Instructor hang-out, push a button, and it would start right up. By the time I got in, heat was pouring out of the vents and the ice was melting off the windows. Pretty cool. We were pleased to meet the transportation needs of our land sojourn at an acceptable cost. A month or so after purchase, the new-to-us Land Dink began to shudder once in a while when pulling away from a light, particularly if it was going uphill. It felt very much like I had forgotten how to drive a clutch. Possible, I guess, but this was an automatic. Some days it would be better, other days worse. But the overall trend wasn’t positive. Having long ago learned to be pro-active when it comes to mechanical things going wrong with a Dink, we drove it the hour plus back to the Dealer Of Repute and dropped it off for repair. Two days later they called. There wasn’t anything wrong, or so they claimed. Test drives along with computer and visual checks were clean. Come again? I may not be a car guy, but I am pretty good at telling when something isn’t working. And it seemed highly unlikely that the seat of my pants were more sensitive than the various sensors built into a modern car. But what are you going to do? It is really hard to fix that which isn’t obviously broken. At least they didn’t charge us for not finding anything wrong, the rental dink being the only blow to the bank account. A few weeks after the shop insisted that all was well, the shudder was joined by Traction Control warning light in the dash, and with that the cruise control went away. At first it seemed like a good sign. A traction control problem could, possibly, lead to such a shudder. Maybe a bad but hitherto intermittent sensor lay at the root of the problem? Though not likely, at least it seemed possible this would be a relatively painless fix. We made an appointment with a nearby dealer to look at the car. Before the appointment date arrived an engine warning light appeared as well. The traction control fault had shut down the cruise control. The engine fault shut down the remote start. The Land Dink was getting to be just as annoying as our water Dink had once been. But with lights glowing, there were clearly things broken that could be found and fixed. The first thing the new shop did was download the fault history from the car’s memory file. There was a lot to read. Multiple failure codes associated with the Traction Control, piled on top of those that came from the engine’s oil pressure system. Add the whining noise that turned out to be a failing fuel pump, and front brake disks that were warped just enough to heat up and cause the steering wheel to shudder. Repair costs quickly added up to more than the car had cost in the first place, though the shop suggested it would probably run for a few weeks, maybe even months, as it was. We paid a modest troubleshooting fee and limped home. The Land Dink was a dud. Several days of debate ensued. Go cheap again and hope lemons don’t fall in pairs? 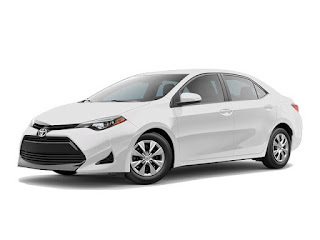 Buy more expensive but still used and get some lemon warranty as well as some modest retail value in a few years? Reliability was an issue that came to the fore as I limped back and forth to work. 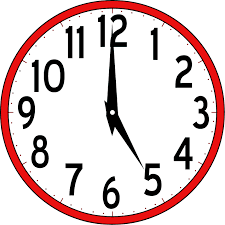 The schedule can cover odd hours of coming and going in the wee hours of the morning or deep into the night. The trek from home to shop traverses some parts of St. Louis that are places that one does not want to be stranded in the wee hours of the morning or deep into the night. Hem and haw, consider and debate, decide, un-decide, and decide something else. The dull gray Land Dink went away. In its place is a brand new, shiny white Land Dink of good repute, complete with a bow to stern warranty. All decisions eventually get judged somewhere off in the future, where things not yet known are old hat. If a dull gray dud of a Land Dink is the worst decision I make while back here on land, I’ll think we did pretty well. 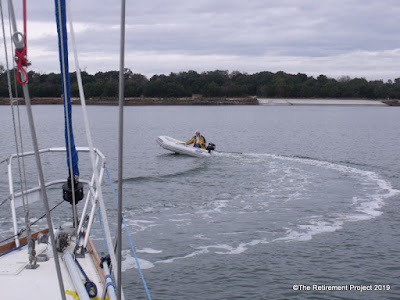 I wrote this post after we bought our starter boat, Nomad, but before we bought Kintala. Our cruising plans were just really beginning to take shape, so for those of you in that foggy middle ground of the 5-year plan, this one's for you. I spend a good bit of my week at work doing graphics for marketing materials for the aviation parts company that I work for. I was working on some pictures this past week of a group of long hoses that our hose shop sells and my manager chose the picture he wanted for a brochure but made the comment that he wanted a longer depth of field on the hoses. "You need to get these fully in focus, Deb." he said. It's funny how very small, simple statements like that can have a profound impact. Later that evening I began reading the copy of The Voyager's Handbook by Beth Leonard that had just arrived courtesy of Amazon. She spends a good deal of time in the early chapters talking about the cost of cruising and encourages her readers to honestly evaluate their financial readiness to embark on the path to the fulfillment of their dreams. After completing the chapter I opened a new Excel file and began to jot some figures down. Somewhere between "Current Savings" and "Annual Income - Post Retirement" a remarkable shift began to take place. 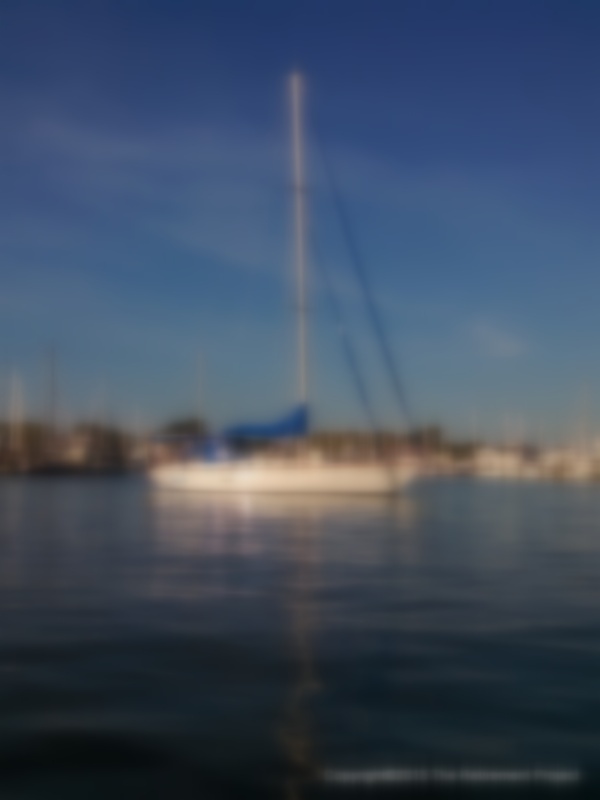 Until this point, my dream of retiring to a sailboat has been something akin to sailing along in New England fog...a vague image of a boat and shores unknown, with no clear picture of the details. In fact, the "dream boat" has been some odd conglomerate of catamaran and monohull, the journey somewhere between Cape Cod and the "Islands", and the time frame somewhere between now and "I've fallen and I can't get up...the companionway". Thanks to Beth Leonard's countless hours of research and personal cruising experience, and the volunteered information from so many of her cruising friends, out of the fog sailed a mid to late 80's 36-40 foot, cutter-rigged monohull firmly in the middle of my figures. Depth of field is still a little shallow, the boat isn't fully in focus yet, but my dream has gone from maybe...possibly...want it to be...to a budget in my spreadsheet. A budget that I can make work. A budget that can buy a real blue-water crusing boat. But what boat, you say? Hmmmmmmm I'm focusing...stay tuned. Hi. Just in case you're new to this blog, my name is Kintala. I'm a 1982 Tartan 42 designed by Sparkman and Stevens. They really know how to design sailboats, so I have lovely, sleek lines. My hull is designed to have a long waterline when I'm heeled over, and the extra length allows me to go just a little faster. I'm a cutter rigged sailboat, and I just love it when the wind is kicking up and I get to leap over the waves flying everything I've got. My owners took me from a sad, sad state of neglect and over the last 8 years they worked on every single system I have: improving, customizing, polishing, sanding, varnishing, and giving me all sorts of new stuff like an easy to hoist mainsail with a Strong Track system, a custom dodger and bimini with a nifty bug screen enclosure to keep the no-seeums out of my cabins, 300 watts of solar, and my favorite, a custom bulkhead table with lots of storage. In order to do all this work, they built a custom workshop with tons of storage for tools and parts (and they have a LOT of tools...) and a real honest-to-goodness workshop bench with a vise. I have this awesome Mantus anchor on my bow that doesn't ever drag. I love to spend lots of days relaxing at anchor in the Bahamas while my Captain plays ukulele in the cockpit and my Admiral bakes all sorts of delicious smelling things in the galley. She has a couple weeks' worth of supplies stashed in my big pantry so there's always yummy smells wafting from my companionway. I have an amazingly comfortable V-berth where they lay and watch the moon rise and talk till all odd hours of the night about all things philosophical. I guess being out in nature tends to make you think like that. Any way, they sorta ran out of money before they ran out of places to travel, so for now I'm stuck on these miserably uncomfortable metal jackstands in a boatyard in Florida while they make enough money to go cruising again. I'm not usually one to complain, but I did inform them that I was a sailboat, not a Yard Queen, and that I would much rather prefer the sound of water rushing alongside my hull rather than the blasted trains that run up and down this stretch. So they agreed to trust me to the care of an awesome broker named Melanie Sunshine Neal (don'tcha just love her happy name?) and see if she could find me some new people so I could get back to the water I love so much. And to help me find some new people, they reduced my price to $69,900 this week. So if you want to see all the pretty pictures of my insides, click here. And if you want to talk to Melanie about coming to meet me, just contact her through my Yachtworld ad. I can't wait to meet you! For those of you who might be in the middle of your five-year plan to go cruising, I wrote this post about the things that are difficult to leave. Untangling yourself from land life is not for the faint of heart. The second day of our ASA 103 course we got to the marina early and we were sitting in the cockpit of the Catalina 31 in sweatshirts drinking coffee and enjoying the crisp fall morning. Even though I am credited for the plans to retire to a sailboat, it was Tim who said "we gotta find a way to do this" as he leaned back in the stern seat and closed his eyes to let the sun warm his face. It was the beginning of our Five Year Plan. We've done pretty well so far, taking four ASA courses, buying a boat, living on her every weekend and learning about the systems and the new way of life in confined spaces. I've started the slow process of cleaning out closets and paying down bills. We've read everything we can get our hands on and talked to everyone who will put up with our questions. It appears that we've gotten to that place in our Five Year Plan where we're beginning to think about those things that will be last to deal with, the hardest to part with, the last string to cut. In nearly every story, article, and interview we read, the question eventually comes up - what were the hardest things you had to say goodbye to when making the break from land? I pay close attention to these in preparation for my own cutting of the strings. There is a certain amount of trepidation involved in my ruminations, a fear that when the time comes I may not be able to follow through. This is also a feeling that every liveaboard cruiser has dealt with, so at least I do not go there alone. This weekend was a weekend away from the boat, a trek to our annual sport bike rally in the north central portion of Arkansas. The 300 mile ride there gave me plenty of time to think about the situation, objectively removed from Nomad. Clearly, the ZX-14 is at the top of the list. Clipping along on fantastic Arkansas roads deep into triple digits is an adrenaline rush that would be difficult to match. On the other hand, as I sat around the bonfire later that evening, it occurred to me that I'm probably getting a little too old to be rip-snorting around Arkansas roads deep into triple digits. As if on cue, just moments later I remembered sitting on the Lavezzi 40 catamaran during our Memorial Day ASA 104 /113 course and thinking I could very easily call home and tell them to sell everything and send me a check. I could have walked away and not looked back. It's an odd place to be, this in-between stage in our Five Year Plan. One foot on land, one foot on the boat...looking back...looking forward...but I find myself looking back less and forward more. It surely helps that our cruising will take us to visit family that we don't see now. A lot of cruisers are saying goodbye to family when they leave the land which makes it bittersweet. Our ventures, though, will be taking us to grandkids, nephews, friends. It also helps that I desperately want to simplify life. At the moment, every minute of every day is accounted for - laundry, bills, cooking, cleaning, helping our kids, and the miriad of daily errands that living on land requires. I want desperately to get up in the morning and have nothing better to do than drink my coffee in the cockpit while I plan the day's boat chores and watch the great blue heron scout his breakfast. As much fun as I've had this weekend, I can see the strings holding me to land growing threadbare. When the time comes, I'll be ready. When I wrote this original post we owned our first lake boat, Nomad but were still three years away from buying Kintala and five years away from going cruising. We have been luckier than most because not only did we enjoy our time on the lake on Nomad but we got to travel for five years on Kintala and have some of the most amazing experiences. Looking back on it, though, if even the only thing we had gotten to do was to sail Nomad on the lake all those weekends, enjoying the wind and the water and the white pelicans and the sunsets, we would still have succeeded at squeezing every good thing out of each moment. Many people plan to cruise and consider themselves failures if they can't make that dream a reality. If cruising has taught me anything, it's that I will have succeeded if I enjoy every moment of life as it comes, even the preparations to go cruising. One thing I've noticed is that owning a boat makes you much more aware of the weekends. We sat around last night, after coming home from the lake, planning out the remaining weekends till the ice hits. I decided two things: A)There's not enough of them B)There's not enough of them. While complaining about this very thing at work one day, someone told me that Tim and I have "too many toys". I've been musing on the subject a lot since he said that, wondering if I was somehow guilty of using up someone else's share of toys, guilty of paying an inadequate amount of attention to the duties that beset me at work each week. And then...I think about my sister-in-law's battle with melanoma these days and I decide that one can't have enough time spent playing with toys. We spend so much time concentrating on the process of making money, to what end? None of us knows whether we'll ever make it to retirement in the first place, or who we'll spend it with. I guess I've decided to enjoy it now, and to spend it with my favorite person. I've always loved a poem called Life's Clock which has one line that is my mantra: "The present only is our own"
To lose one's soul is such a loss that no man can restore. Place no faith in tomorrow -- for the clock may then be still. –verb (used with object), -set, -set·ting. 1. to attack on all sides; assail; harass: to be beset by enemies; beset by difficulties. 2. to surround; hem in: a village beset on all sides by dense forest. 3. to set or place upon; bestud: a gold bracelet beset with jewels. 4. Nautical. to surround (a vessel) by ice, so that control of the helm is lost. The ice is closing in...and I intend to enjoy the water while I can and the wind (however little there is) in the sails. Before we left to go cruising, we used to ride two of the fastest production motorcycles on the planet. One of the most common questions we would get from people was how could we go from 150+mph to 6 knots? This was my reflection on that. My eldest daughter has a thing about noise, specifically man-made machine-type white noise, the type of which seems to proliferate with the advance of technology. While I, ever the technocrat, adore all things technologically cool, it occurred to me this weekend as Tim pulled the fuel lever to kill the engine that she may have something there. The silence enveloped me in the cockpit, punctuated only by the breeze, the bow wave, and the occasional seagull and I found myself sighing with relief. So much so, that when we neared "Party Beach", a strip of sand that hosts 3 or 4 dozen power boats each weekend, and began to play chicken with said bearers of drunken party-goers, I found myself bearing away just enough to head out to quieter waters at the roaring speed of about 1 knot. This may seem strange for the rider of the world's fastest production motorcycle and is, in fact, a conundrum I have been unable to answer yet when asked (and it happens often). There is something so primitively basic about the need for peace and quiet: thoughts need time to dance and blend without interruption, in order to culminate in those rare and wonderful epiphanies we sailors are famous for. And yet...we packed up the bikes tonight to head home and as soon as I twisted the throttle...I guess I have a need for speed sometimes as well. I guess I'll have to ponder it a little longer next time on the boat. If those power boaters will just leave me alone long enough to think, that is. If you've ever found yourself dreaming of selling everything, moving onto a cruising yacht and pointing it toward warmer weather and white sandy beaches, this book is for you. 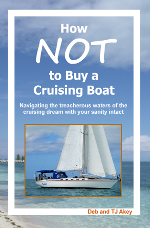 How NOT to Buy a Cruising Boat will help you to navigate the search and purchase of your cruising yacht with your sanity intact. Available on Amazon.com. Click on the photo to buy. 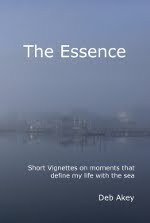 The Essence follows the author's journey through the search for a more meaningful life. 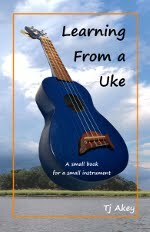 This is not a book about how to play the Ukulele, but why playing one can change the world. "The main reason that he wears a harness and tether is that doing so slows him down and makes him constantly mindful of the risks of going overboard as he works on deck and that, in turn, makes him far safer than any gear ever will." John from Attainable Adventure Cruising on Wilson Fitts Why? "It is not just because I love to sail, or because I love to travel. It is the desire to live a more simple life, a place apart from the gross consumption of the modern first world. The desire to teach my children respect for our fragile planet by living with a light footprint. The desire to embrace live in the now, and not postpone it for an amorphous 'someday.' "
Behan Gifford "Between us there was, as I have already said somewhere, the bond of the sea." Joseph Conrad, Heart of Darkness "Who is staring at the sea is already sailing a little." Paul Carvel "Find what and where you want to be, discard everything that doesn't get you closer to that and laugh like a school girl when you arrive." John Loggins "It is good to have an end to journey toward but it is the journey that matters in the end." 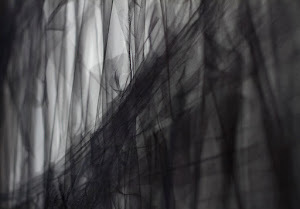 Ursula Le Guinn "Life is about having experiences and then keeping those memories. I don't remember what toy you got me for my fifth birthday but I'll always remember having an Easter egg hunt party. The matter of things break down but the nonphysical aspect of experience can't be touched. The memories we make are less frequent but they become more meaningful." Some amazing art by my favorite artist. 100 Things to do on a boat. What does a man really need? Toast Floats "Packing it on"